This straw purse planter exudes summer beauty when filled with brightly-hued annuals that bloom tirelessly all season. 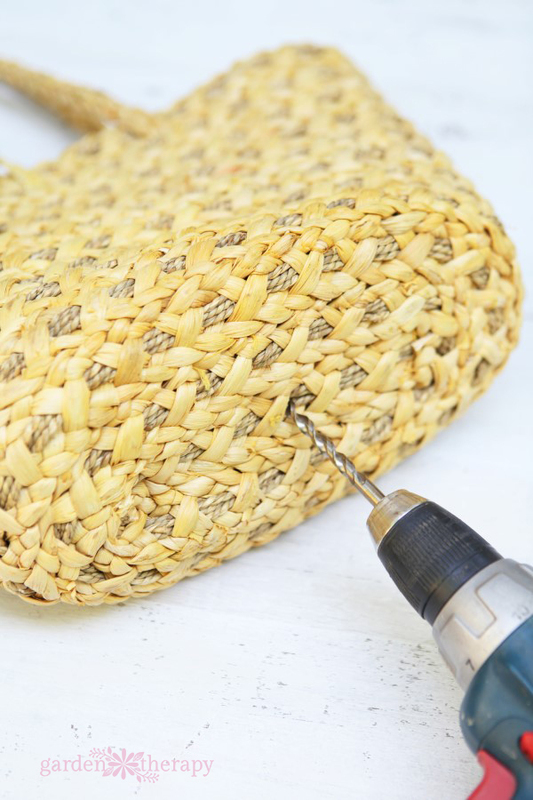 Straw bags are readily and inexpensively available at thrift stores and that makes them a great option for making decorative purse planters for home decorating, summer events, and fundraising. 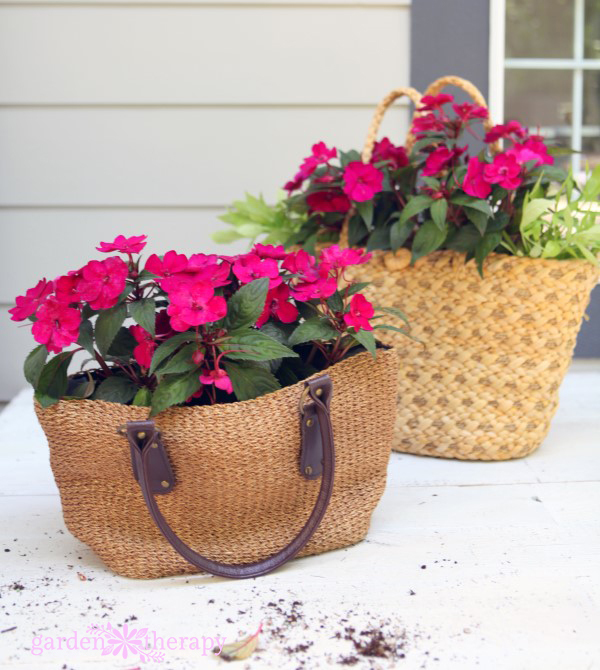 You can very easily collect a large number of purses and convert them to planters with a few easy modifications. 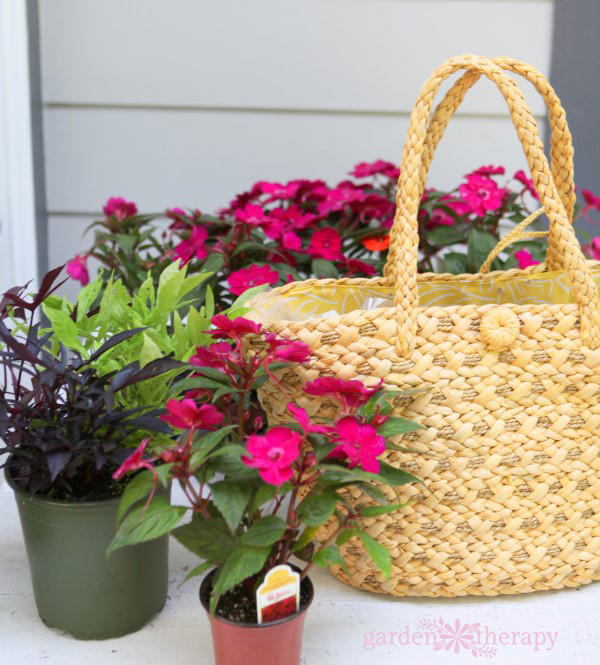 I planted mine with vibrant SunPatiens® Compact so they will bloom all season in either sun or shade. Disclosure: this project has been sponsored by Sakata, the creators of SunPatiens, who also provided me with the plants to try. I used SunPatiens® Compact “Royal Magenta” in this project, but there are many other gorgeous hues available. All opinions are my own. 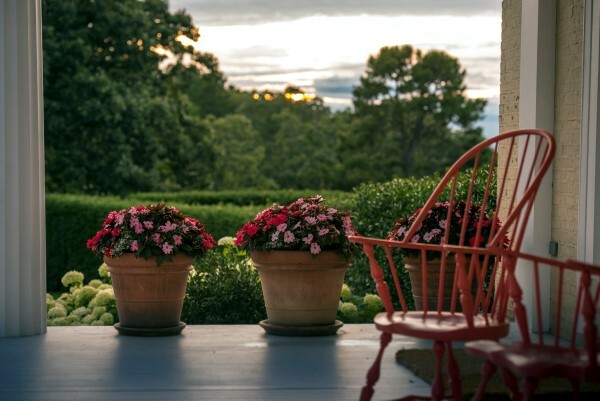 I first noticed SunPatiens at Moss Mountain Farm in Arkansas as the coral blooms were perfectly matched to P. Allen Smith’s coral-painted porch furniture. There are two new varieties in this year’s planters as can be seen in the photo above provided by P. Allen Smith. It seems that once you notice something you really like, then you start to see it everywhere! I saw them again at the Epcot International Flower and Garden Festival and again at the California Spring Trials. Read more about that and see how to make a DIY Floating Pond Planter while you are at it! 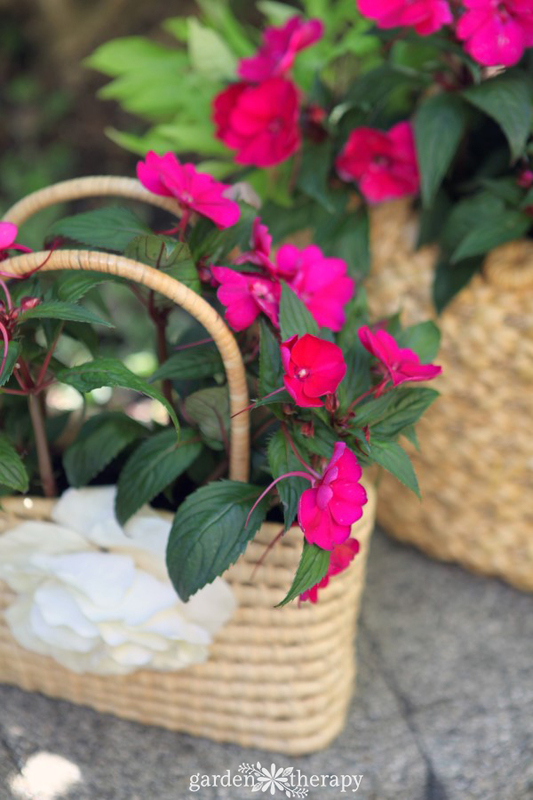 SunPatiens are a hybrid of wild impatiens and New Guinea Impatiens bred by Sakata, a Japanese seed company. 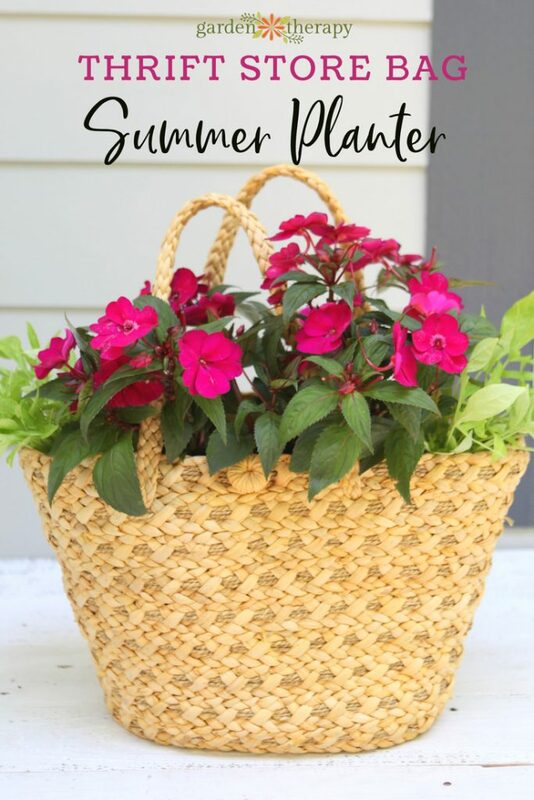 The result is a variety of impatiens that thrive in full sun to partial shade, have continuous color from the spring through hard frost, can handle high heat and humid conditions, are easy to grow and low-maintenance, and are unaffected by downy mildew. SunPatiens are unique because Sakata works with the Indonesian government and Convention on Biological Diversity (CBD) to ensure conservation and benefit to their native country. As with everything, there are knock offs out there. 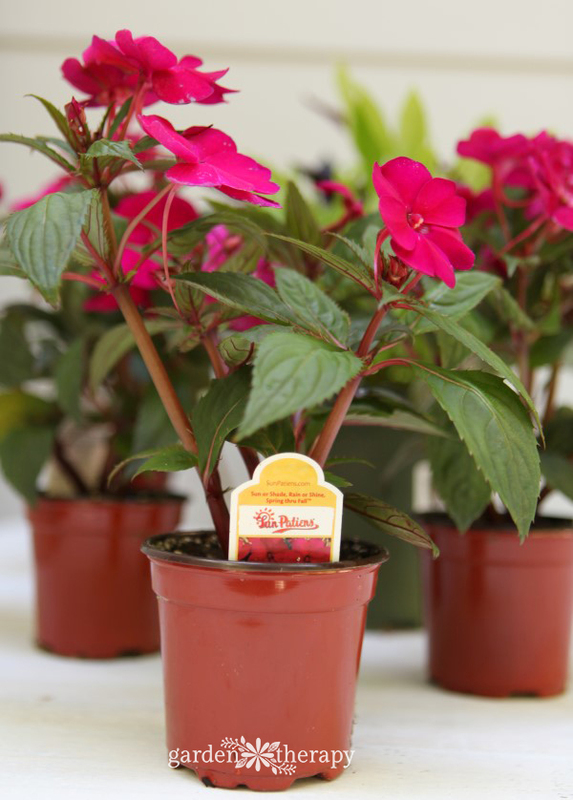 Be sure to always check the tag for the SunPatiens name to be sure you are getting the real thing and truly support Sakata’s efforts. Not every project needs to be built to last for many years of garden beauty. Some are fleeting, just like the summer months. In some ways, this makes them even more beautiful. To enjoy something wholeheartedly for a short period of time can bring immense joy and gratitude. I was once against annuals in my garden, as it seems like you get better value from perennials. But I have since learned the error of my ways. 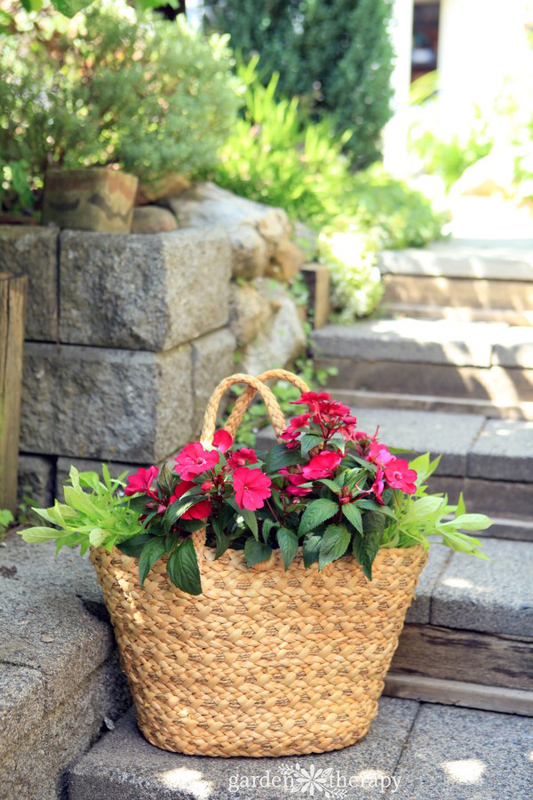 Annuals like Sunpatiens can provide a robust season of blooms that a perennial just cannot. Annuals bloom their hearts out and go out with a bang at the end of the season. Perennials need to hold back so they can live to bloom another year. Annuals have a special place in my garden and my memories, and I can switch them up each year to redecorate. Just like annuals, a straw purse planter is also meant to last the season but be replaced in the following years. Adding a plastic liner will help to extend its life and adding drainage holes will let you keep it outside without worry. 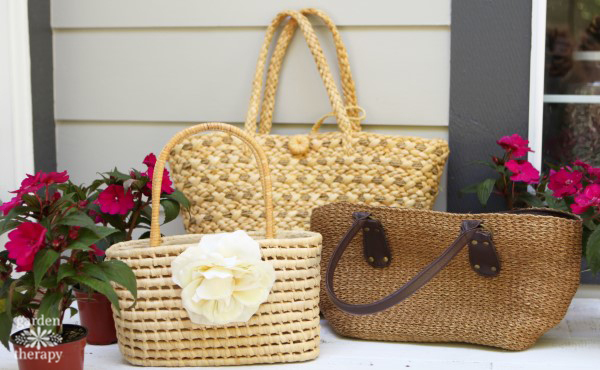 Hunt local thrift stores for a straw bag that would be suitable as a planter. I found three for under ten dollars that all look lovely together. You could certainly use any kind of purse for this project, as long as there is enough stiffness to the material that it stands up well to planting. 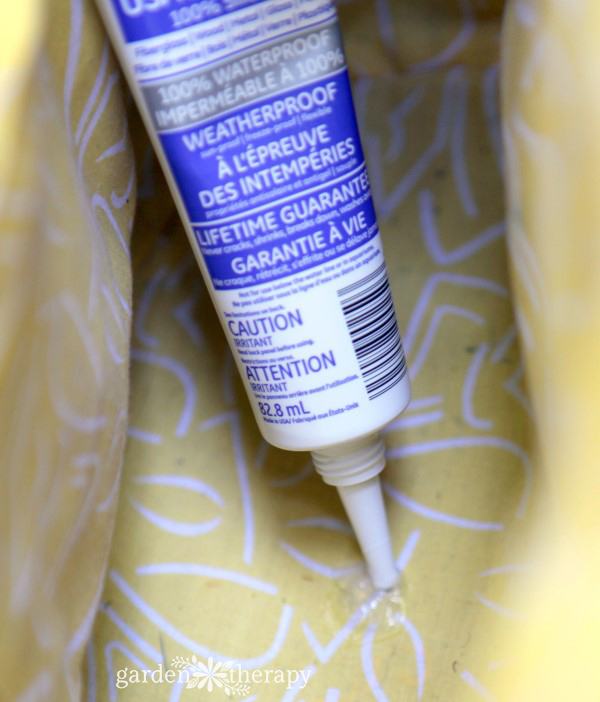 Add a dollop of outdoor silicone sealer to the center bottom on the inside of the purse. Spread the dollop out to a silver-dollar sized circle. Let dry according to package instructions. This is the first step in creating a drainage hole. Cut a piece of plastic (or use a plastic bag) to line the inside of the purse. Use spray adhesive to attach it by spraying the bottom of the bag first and adhering the plastic to the bottom. Next, spray the sides and attach the plastic. If you spray the whole inside at once, the plastic will stick on its way down and turn into a mess (lesson learned!). Use the drill to make a hole in the plastic and purse bottom in the center of the silicone circle. Use a bit more silicone to seal the inside of the hole, making it watertight. You could also use a grommet to create the drainage hole, given that measurements suit the thickness of the bottom on the bag. 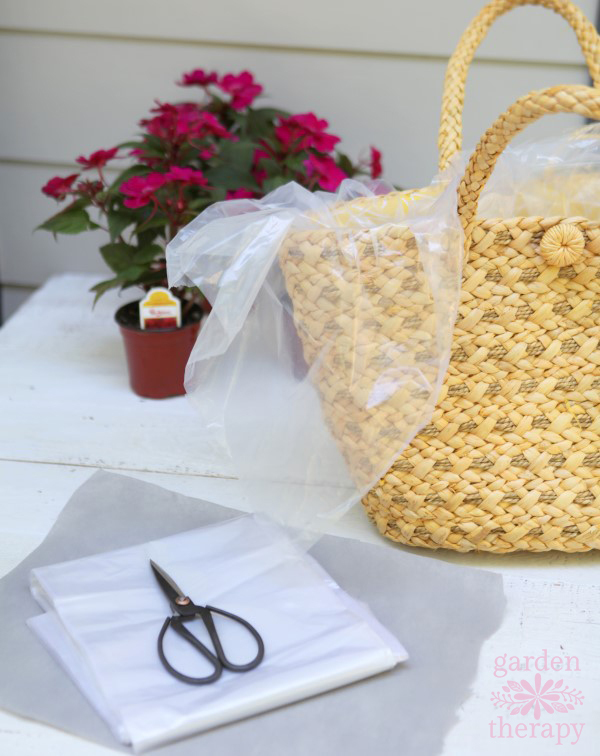 Line the inside of the bag with a piece of landscape fabric to prevent soil from coming through the drainage hole. 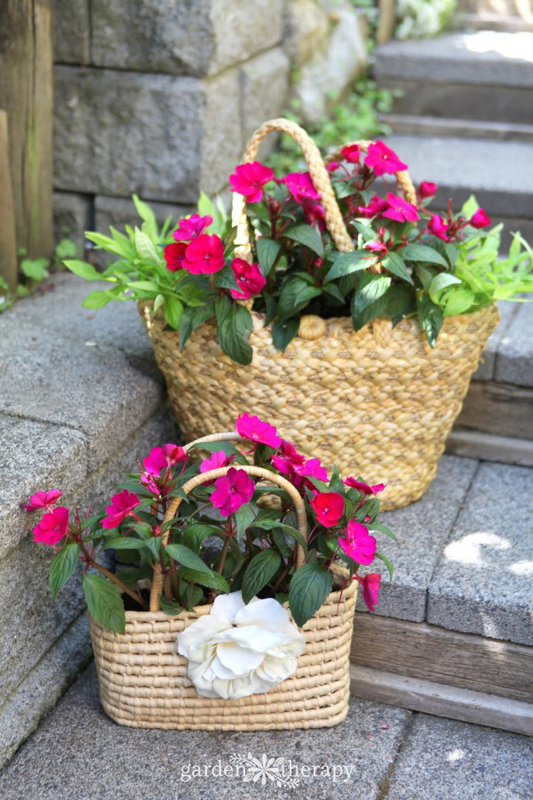 Optionally, you can add a few pebbles to the bottom or a larger purse for weight and drainage, but this is not necessary with smaller straw purse planters as the soil will not compact as much. Fill the purse ¾ full with a good quality container soil or make your own soil mix with 1 part peat moss, 1 part compost, and 1 part garden soil. 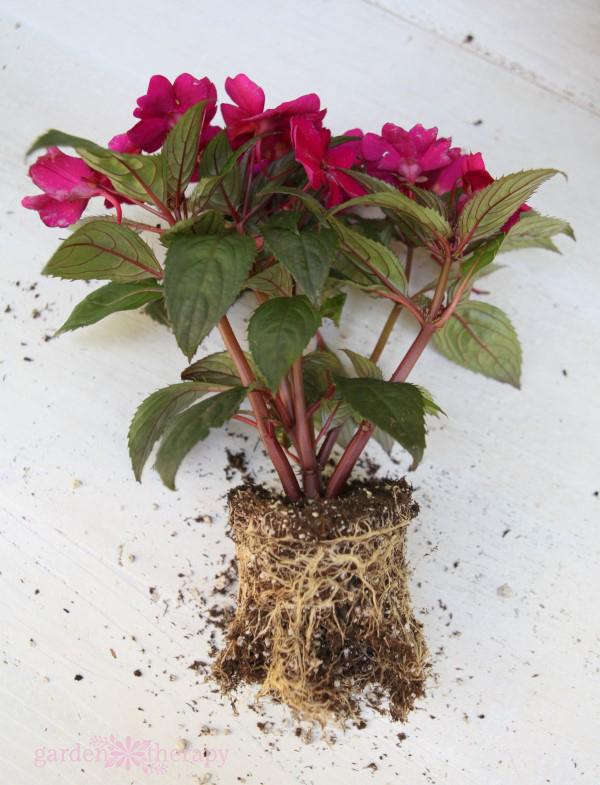 Plant SunPatiens by removing them from the nursery pot and gently separating the roots. Add the plant to the soil and fill in around it with more soil. 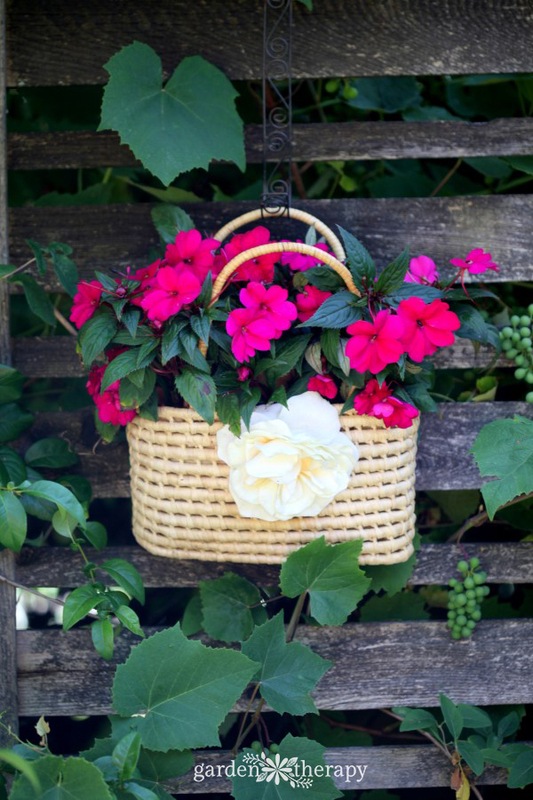 One SunPatiens Compact can grow 14-32″ tall and 14-24” wide in the garden, but it will be more limited in a container. That being said, you should only need one plant to really fill up the planter. Warmer night temperatures (South, Southeast) result in stronger growth while SunPatiens planted in cooler, northern locations are somewhat shorter. Once you have created your straw purse planter, water it well and set it in your garden to fill out. If you have some money to raise, these planters are a great fundraiser! By thrift shopping or getting donated purses, some soil, and one plant, the cost of each one will be $5-8 each. I bet you could easily sell these for much more and do some good for your charity of choice! Don’t understand why you drill the hole, then apply more silicone sealer to “make it watertight.” Could you explain? This is such a cute idea! Ah, great question! I just used the sealer to seal around the hole so water doesn’t get past the plastic to the straw. I can see how that sounds like I’m sealing up the hole I just made! But, no, I’m sealing the ring inside the hole so water can still drain out.